An overjoyed Ryan McDonagh reacts to his first NHL goal at 11:59 of the second period on Saturday. The rookie defenseman McDonagh's goal put the Rangers ahead 3-2 and stood up as a game-winner. With their playoff lives hanging in the balance, the Rangers rose up and erased a pair of one-goal deficits en-route to a convincing 5-2 victory over the Devils in the regular-season finale on Saturday afternoon at Madison Square Garden. 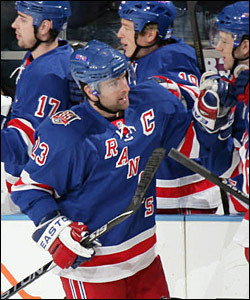 The Rangers finished the 2010-11 season with 44 victories and 93 points -- six wins and six points better than a year ago. Yet despite all of their success this season, they had to wait a few more hours to learn their postseason fate. Should the Carolina Hurricanes lose their game against the Tampa Bay Lightning tonight -- either in regulation or in overtime -- this evening, then the Rangers would advance to the Stanley Cup playoffs for the fifth time in six seasons. A Carolina victory would tie the Rangers with 93 points, yet the Hurricanes would be awarded the tiebreaker because they have more non-shootout victories than the Blueshirts, even though the Rangers would have three more overall victories (44-41) than the ‘Canes. Rangers head coach John Tortorella expressed pride in his club following the game, while also admitting he’ll be a bit anxious tonight, although he will choose not to watch the Hurricanes play his former team, the Lightning. Dan Girardi, Artem Anisimov and Vinny Prospal celebrate Prospal's goal at 10:49 of the third period on Saturday. Prospal's goal was the game's final tally in a 5-2 Rangers romp over the Devils at MSG. Rookie defenseman Ryan McDonagh snapped a 2-2 tie by scoring his first NHL goal 11:59 into the second period for what turned out to be the game-winning score. McDonagh whizzed a shot from the right circle past the gloved hand of Devils goalie Martin Brodeur after some excellent work beneath the goal line by Rangers’ forwards Vinny Prospal and Marian Gaborik. McDonagh’s goal handed the Blueshirts their first lead of the game and set off a joyous celebration on the ice, highlighted by the rookie’s impromptu jig after scoring. It is fitting that the Rangers’ final regular-season victory saw the 19th different player score the game-winning goal. The Rangers have received contributions from the entire lineup all year long, and that statistic is just one more example of that. The Devils scored just 2:03 into the game -- and again with 41.8 seconds remaining in the first period -- but the Rangers received a clutch goal from team captain Chris Drury in between and thus the Blueshirts trailed by one entering the second period. Playing for the first time since Feb. 3 following knee surgery, Drury drove to the net to convert a rebound of Erik Christensen’s shot at 3:14 of the opening period. The goal, Drury’s first of an injury-plagued season, came on his first shift of the game and first in more than two months. Drury received 7:48 worth of ice time and played with tremendous energy while firing three shots on goal and winning four of six faceoffs. Rangers captain Chris Drury is congratulated at the Blueshirts bench after scoring his first goal of the season in his first shift after missing 27 games with a knee injury. The goal at 3:14 of the first period, pulled the Blueshirts into a 1-1 tie with New Jersey. The Rangers exploded for three goals during the second period to put a stranglehold on the game. Wojtek Wolski scored the important tying goal just 1:52 into the middle stanza to settle the nervous building down. Wolski broke in on left wing on a 2-on-1 rush with Derek Stepan and had his shot deflect off Henrik Tallinder’s stick and past Brodeur for his 12th goal of the season. Then after McDonagh had given the Blueshirts the lead later in the period, Brandon Prust jumped off the bench and charged to the net to chip in a rebound of Brandon Dubinsky’s left-wing shot at 16:06 to provide some breathing room for the desperate Rangers. Prospal closed out the scoring with his ninth goal -- off a pretty feed from Artem Anisimov on a 2-on-1 -- with 9:11 remaining to play in the third period. From that point on The Garden Faithful alternated between chants of “Let’s Go Rangers”, “Hen-rik, Hen-rik”, and even “Let’s Go Lightning” before the final buzzer sounded bringing an end to the regular-season.